The word “invisible” enters a woman’s lexicon early, certainly in this country. By the time midlife arrives the change from seen to unseen is pretty much complete. Add the relentless drumbeat of the anti-aging industrial-complex and it’s no wonder many middle-age women feel marginalized. They are. Two friends — Faith Baum and Lori Petchers — were talking about it several years ago when they stumbled on an idea for an art project. The Old Bags Project, Baum’s and Petchers’ multidisciplinary exploration — in image, text, and sound — of middle-age American womanhood, has been exhibited in galleries across the Northeast, projected onto buildings, fashioned into video installations, published as a book (“Old Bags Taking a Stand,” and spun off as an Instagram community and a blog. The pair will lead a discussion about it Thursday at the Cary Memorial Library in Lexington. 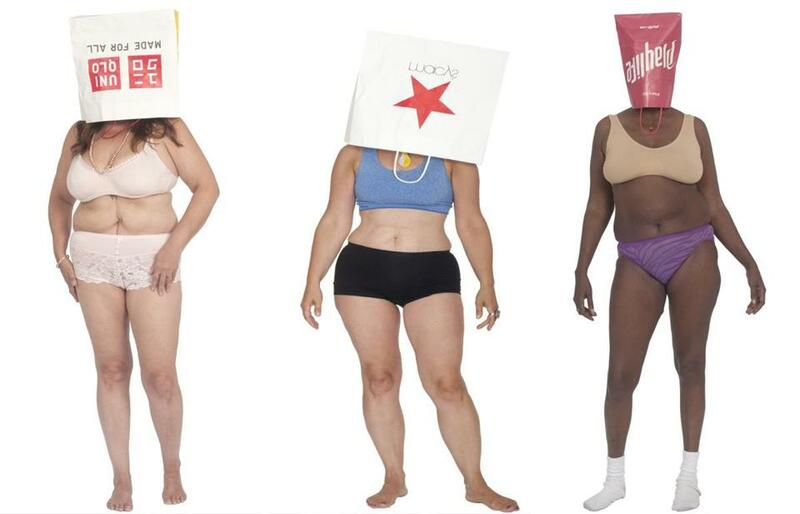 Visually, the project is simple and striking: photographs of women in their underwear with shopping bags over their heads, many from trendy retailers that cater to the young — Lucky Brand, American Eagle Outfitters, and the aptly-named Forever 21. The photos are accompanied by text or audio from interviews with women whose experiences of midlife are as varied as their shapes and sizes. Some grieve for their lost youth and beauty. Others are relieved to be finished with the scrutiny and pressure to conform. A few reject the notion altogether that the gaze of others has any bearing on their identities. Inspired by the Guerilla Girls, a collective of masked female artists who expose discrimination in the art world, Baum and Petchers, a 56-year-old filmmaker living in Fairfield, Conn., were their own first subjects. Uncovering their bodies is a way to refuse being defined by a society that says a woman’s value is attached to how much she resembles her younger self. At the first Old Bags exhibit, in New Haven in 2011, the pair put out a sign-up sheet to recruit women interested in posing for the project. So far 60 have participated: large women and small, dark and light, sturdy, saggy, lithe, wrinkled, meek, muscled, graceful, tattooed, in hot pink satin and baggy beige briefs, each one wearing a shopping bag on her head. Baum goes store to store at the mall asking for them. She explains how she uses the bags and has only been turned down once, by a clerk at the fitness-apparel behemoth Lululemon (a company notorious for its recall of too-sheer yoga pants which, incidentally, don’t come in a size larger than 12). She and Petchers arrange the bags in rows at photo shoots and ask each woman to choose the one she’d like to wear. Some make a beeline for a bag from a store they frequent, Eileen Fisher or Banana Republic, and some make a point of selecting one from a store where they wish they could shop. The ubiquitous corporate logos become wonderfully personal in the photos, statements of selfhood or transformation or loss. Faith Baum (far left) and Lori Petchers, co-creators of the Old Bags Project. The shopping bags work on many levels — neutralizing an age-old insult, poking fun at consumerism, preventing viewers from shifting their gaze to a woman’s face as a refuge from the taboo sight of a middle-age woman’s body. For the vast majority of the women, obscuring their faces freed them to expose their bodies. The tension between wanting to be seen and not wanting to be labeled is complicated, and not just for women. Ashton Applewhite, a New York anti-ageism activist and author of “This Chair Rocks: A Manifesto Against Ageism,” urges people to look harder at the source of those social designations, at the relentless flow of messages that beauty is one narrowly defined thing and that aging is something to be cured. The Old Bags Project wants to shine a light on the debasing effects of ageism, yes, but also on the insidiousness of it — the hard truth that even thoughtful and enlightened people feel compelled to play by its twisted rules. Hearing Baum describe it, the photo sessions, in a studio, sound like a combination therapy session, rally, and dance party. The women who pose for the Old Bags Project are between 45 and 70 but the circle is expanding. Their children bring friends to exhibits, and with the publication of the Old Bags book last year the project is gaining a wider audience. A friend of Baum’s from Lexington who posed says that her 22-year-old daughter has been profoundly moved by it, a reaction that is both gratifying and troubling. 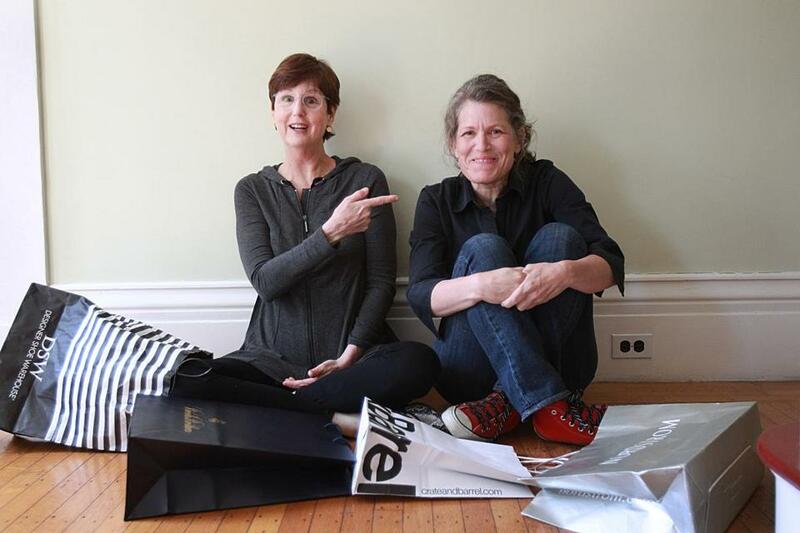 Faith Baum and Lori Petchers will lead a discussion, “Old Bags: The Art of Midlife,” on Thursday, May 26, 7 p.m. at the Cary Memorial Library, 1874 Massachusetts Ave., Lexington.